Coral trout in protected ‘green zones’ are not only bigger and more abundant than those in fished ‘blue zones’ of the Great Barrier Reef Marine Park, but they are also better able to cope with cyclone damage, according to a long-term study published today in Current Biology. Coral trout in protected ‘green zones’ are not only bigger and more abundant than those in fished ‘blue zones’ of the Great Barrier Reef Marine Park, but they are also better able to cope with cyclone damage, according to a long-term study published today in C u r rent B i o l o g y .
Coral trout biomass has more than doubled since the 1980s in the green zones with most of the growth occurring since the 2004 rezoning. These and other changes identified by the study show that the green zones are contributing to the health of the Great Barrier Reef and that similar approaches may be beneficial for coral reefs around the world. The joint project between the Australian Institute of Marine Science and the ARC Centre of Excellence for Coral Reef Studies at James Cook University combined a vast amount of information from underwater surveys carried out from 1983-2012, on reefs spread across approximately 150,000 km2 (more than 40 per cent) of the Marine Park. The Marine Park was rezoned in 2004, and marine reserves where fishing is prohibited (called ‘green zones’ because of their colour on the zoning maps of the Marine Park), were expanded to cover about one-third of the total Park area. These green zones previously made up less than five percent of the Park. 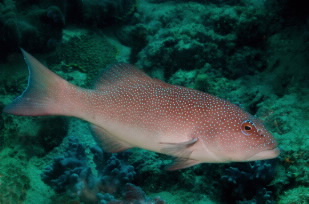 The study demonstrated that the Reef’s network of green zones is yielding wide-scale population increases for coral trout, the primary target species of both the commercial and recreational sectors of the hook-line fishery. It also found that reefs in green zones supported higher numbers of large, reproductively-mature coral trout, even after being damaged by cyclones—such as tropical cyclone Hamish, which hit the reef in 2009. The findings provide compelling evidence that effective protection within green zone networks can play a critical role in conserving marine biodiversity and enhancing the sustainability of targeted fish populations. “It’s heartening to know the green zones are working as we had expected,” said lead author Michael Emslie from AIMS. “Among the world’s coral reefs, fishing on the Great Barrier Reef is relatively light but it has still reduced the number and average size of the few fish species that are taken by fishers. Data since the 1980s show that green zones have been effective in restoring numbers of coral trout to their former levels”.